The OM-NOMAD-340 portable temperature datalogger features a backlit LCD display for easy viewing of temperature data as well as setup parameters. The datalogger’s waterproof housing makes it ideal for a wide variety of applications. Temperature recordings are started and stopped using the front keypad on the datalogger. Stored temperature data is time stamped via the unit’s built-in real time clock. Data is transferred to the PC using the accompanying download box, RS-232 cable, and Windows software. The software screen includes a window that duplicates the LCD display on the datalogger and shows the real time temperature value, memory status, and battery status. The software also displays the minimum, maximum, and average values of the data set being displayed. Downloaded data can be printed in tabular or graphical format and can be exported as a text or Microsoft Excel file. 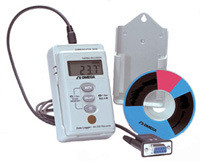 Nota: OM-NOMAD-340 dataloggers are supplied with complete operator’s manual, batteries and wall-hanging tag.